So, at the very end of episode 5, they had two choices—A) Luna meets with Woo Joo and B) Luna meets with Ren. Now, I’m curious if they will continue in a split storyline or rejoin it… Anywho, This part is what would happen if Luna met with Woo Joo over Ren. I’ll do 6B tomorrow. So Ren’s waiting for Luna at a ritzier restaurant. She comes in and apologizes for being late and orders a beer. She asks how the shoot was and is relieved to hear that it went well. Woo Joo then asks for extra time in order to find the missing car and samples. Luna explains that if she does so, then she will probably be fired since Misaki is known for her quick temper and quick kills (meaning firing people for their mistakes). So, what did he want to talk to her about? It’s about the other night. Why did Luna lie? Was she really worried that Ren would be angry? Luna instantly gets angry. Didn’t Woo Joo say he didn’t care about other people’s love lives? It was her decision, get over it. Woo Joo doesn’t care, but he can’t keep from warning her that she should break up with her boyfriend. True, Ren’s got a possessive streak a mile wide. Luna walked out first and Woo Joo follows closely behind. She tells him to leave her alone and stop following her. They live in the same house, how does she expect him to get home? Whatever, Luna refuses to pay him any mind. Her word choice catches his attention. He’s heard that slang at the office, too, and doesn’t quite understand its meaning. LOL. Only Woo Joo would do that during any argument. I do have to say that earlier, the first scene seemed WAY to forced and not quite believable. Anywho, Luna tells him to leave her alone. He says he can’t do that. She insists, but he also insist she doesn’t want to. Luna then almost runs into a tree. LOL. Woo Joo then teases her saying that he saw SMAP member Kimura Takuya. Luna quickly looks, but no one is there. Woo Joo then rushes on into the house, followed by the annoyed Luna while Stalker Ren sits in his car outside unhappy at the scene. Inside, Sung Jun is about to open a bottle of alcohol when they come in. Luna shuts the door on Woo Joo and the two then fight over one chair. Woo Joo claims it first and Luna knocks into him while going to sit in the chair beside his. Is something wrong? They both answer no. Riiight. Sung Jung then asks what will happen now that the assistant ran off. Luna is unhappy to hear the news is already spreading. Woo Joo takes out his laptop and says that he will find the car with Facebook—never underestimate the power of the internet. Thanks to instagram (I actually have no idea really what that is) and geo-tagging, they just might be able to find the missing car and samples. Luna then gets a call and goes out of the room. Luna goes to her room where she talks to Ren. He goes to ask about his unanswered email, but changes his mind. Was she busy? Luna lies and says she was busy working late—alone. It’s not safe to walk alone at night. Don’t worry, she took a taxi. Wow. I know that Luna doesn’t know that Ren saw her return with Woo Joo, but at the same time, why does she find it necessary to lie like she is? Ren does apologize for their fight earlier. He was harsher and in the wrong, but he meant what he said (about wanting to move in together and eventually get married). 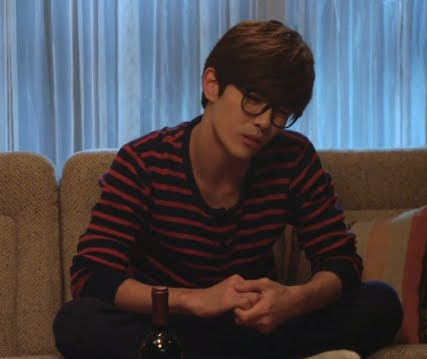 Back in the living room, Sung Jun wishes to know what happened between Woo Joo and Luna. Woo Joo blows off this question saying it’s nothing. Sung Jun knows that isn’t true as he saw it in Luna’s face. Woo Joo shouldn’t get her worked up. Sung Jun then says its not a bad thing to marry the heir of a wealthy family. He then holds up the alcohol bottle and glass. Who would she choose—an ugly rich man or a handsome poor man? A study shows 80% of women would choose the ugly rich man. The problem is that in this case, he’s not only rich, Ren’s freaking handsome. It’s a no-brainer. Woo Joo then says he could care less who Luna goes out with…”but”….but what? Why doesn’t Woo Joo explain himself in these situations? Woo Joo just smiles and tells Sung Jun to drink up. He’s not cut out for this. 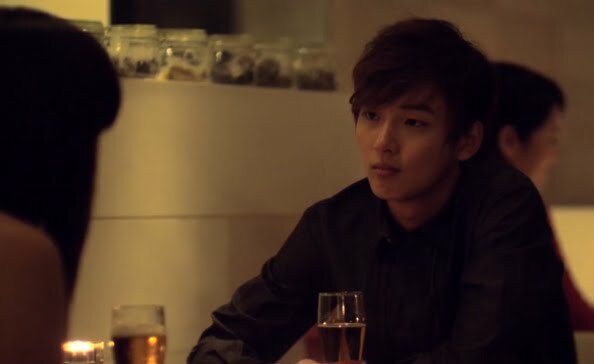 The two clink glasses and drink and Sung Jun studies Woo Joo hard. The next day Luna is in big trouble for the unreturned clothes. Misaki says she should just resign over that big of a mistake. How can Luna work in PR? Especially if she’s covering for her housemate? Abilio comes down and says they can hear Misaki all the way upstairs. Misaki then angrily prepares for the meeting and leaves. Abilio then says that for better or worse, Luna was just chosen to work on their next big project—apparently “Ako-chan” really went to bat for her and insisted on her inclusion…is “Ako-chan” Misaki or someone else? Luna bows deeply and thanks him. Her coworker then comes over and says if the samples aren’t found or are put on the internet before the designs are finalized, then Sakurai’s studio is done for. Luna doesn’t like this piece of news at all. At Sakurai’s office, the boys look at the people who claim to have seen the car. All the dots on the map appear to be concentrated in the bay area nearby. Is this information really trustworthy? Woo Joo then brings up one picture which definitely shows their car. He then asks for some time to go outside and look. Taka gives him two hours to try to track down Kobayashi as they still have a lot of work to do. 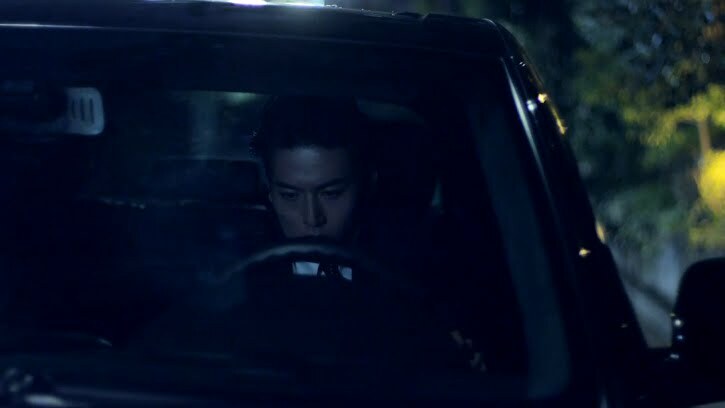 Woo Joo quickly takes to the rainy streets and finds the car. However, before he can get to it (must wait for a traffic light), Kobayashi comes out and drives off. So close. At this time, someone calls the office looking for Woo Joo. Taka replies he isn’t there and then takes out his cell to give the caller Woo Joo’s personal number. The person is Ren! Luna then calls and says she will help him look for the car as well since his studio is on the brink of being ruined. Woo Joo is happy for the offer of help, though shocked by it. He then gets a call waiting beep. 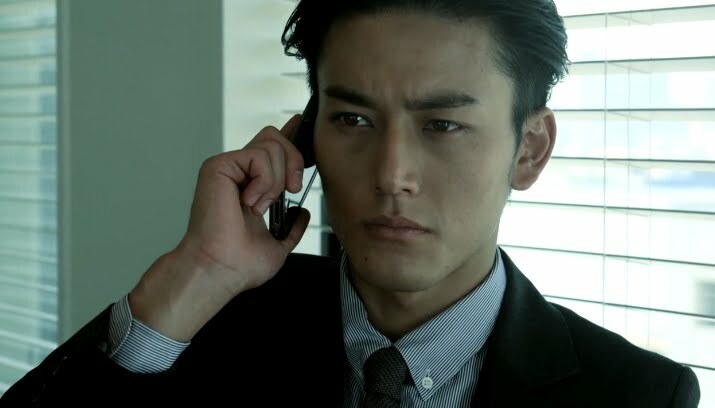 He puts Luna on hold and then arranges to meet with Ren as he has something to say. What will happen if Luna chose Ren instead? Stay tuned to find out.